Have you started thinking about where the road will lead this upcoming RV and camping season? The start of the camping season in Canada is just around the corner – or you could hit the pavement sooner if you decide to drive south of the border! Need a little destination inspiration? Here are 19 unique places to visit in 2019 in Canada and the U.S. Happy travels! Visit the picturesque fishing village or Cheticamp along the St. Lawrence River. Although situated just outside of the Cape Breton Highlands National Park, this destination is just as fun for the adventurous family. The quarry at the Cheticamp Gypsum Mines is especially a must-see! Canada’s smallest province offers plenty of adventure! Cavendish is home to both the Green Gables Heritage Place and the red sandstone Cavendish Cliffs within Prince Edward Island National Park. Relax along Cavendish Beach or hike the trails. The world’s first designated International Dark Sky Park is also known for its neat geological history. The Natural Bridges in Utah are unique must-sees for all campers. Easy hikes meander between each of the three stone bridges — perfect for the whole family to explore! We know the desert can get hot, but warmer desert locations are great places to kick off your camping season a little early. Head south to see the unique wildlife and Joshua trees where the Colorado and Mojave Deserts meet in Joshua Tree National Park. This destination is best enjoyed in early spring. Who says you need to drive all the way to the west to see the mountains? Two mountain ranges meet in the Ozarks where endless rivers wind between lakes in the valleys. Campers love to fish, hike and bike through the summer months. Let’s go to the beach! Assateague Island National Seashore is known for its wildlife! Wild ponies call the beach home and over 300 species of birds live along the shore. Set up your campsite and settle in to relax and watch the world go by. Don’t want to wait until spring to start your camping season? No problem! Drive south to Everglades National Park in Florida (where it’s always warm) to see the USA’s largest subtropical wilderness for yourself. There is so much to see in this park! Stroll the boardwalk trails or catch a boat ride across the wetlands. Northern, southern and prairie landscapes meet in Lake of the Woods Provincial Park. There are over 14,000 quiet islands on the lake! Campers come to these shores to bird watch, canoe and fish, and hike the tree-covered trails. Did you know Canada has a Dead Sea, too? Float in Little Manitou Lake, which is known by locals for its restorative powers from the rich mineral content of the water — it’s three times saltier than the ocean! Alberta’s Badlands are known for their unique landscape and rich history as the Dinosaur Capital of the World. The rock hoodoos and fossils are all that is left of this dinosaur inhabited prehistoric glacial valley — and they make for an amazing hike. Camping is available in Dinosaur Provincial Park and the world’s largest dinosaur lives in nearby Drumheller at the Royal Tyrrell Museum. Vancouver Island is known for its mild climate and amazing views. Nanaimo sits on the mainland-facing shore, but is every bit as beautiful as the ocean side of the island. There are plenty of places to find a family adventure: biking, swimming, hiking — the view from the top of Mount Benson is a must-see! Set up your RV near the shore of Lake Huron on the Bruce Peninsula. Fathom Five National Marine Park protects the ancient freshwater ecosystem. Check out the 22 shipwrecks in the bay or visit Flowerpot Island before taking the ferry to Manitoulin Island. Camping is available on both Manitoulin and the mainland. Travel slightly off the beaten path (ahem, the Trans Canada Highway) to find Invermere, British Columbia. This little town is an outdoorsperson’s dream all year round. When the lake melts in the summer, it’s a haven for campers who like to explore. Hiking and biking are local favourites. If you’re feeling adventurous, check out the Lussier Hot Springs. 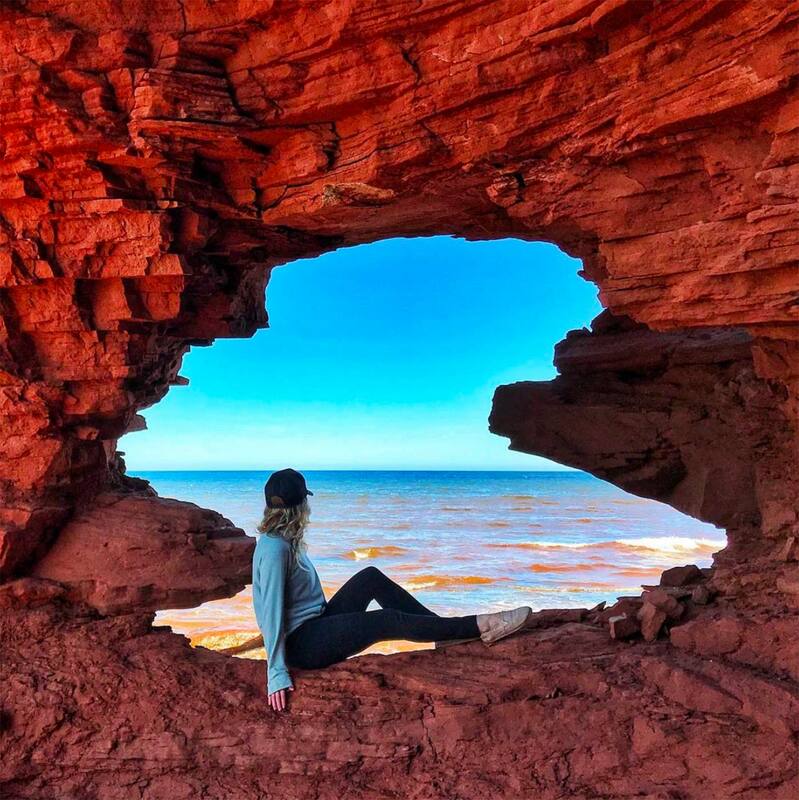 For family adventures, go road-tripping to Fundy National Park in New Brunswick. This well-known destination is unique for a few reasons: the interesting geology, sea caves, tidal bores, the Old Sow whirlpool. All these ocean attractions make for perfect outings from your campsite each day. A hiker’s delight! Check out the boardwalk of Pisew Falls Provincial Park then continue on to Kwasitchewan Falls. These two are the tallest waterfalls in Manitoba. There is only walk-in backcountry camping at the falls, but the nearby town of Thompson has a few RV campgrounds to choose from. If you like to escape from the crowd, Saguenay Fjord National Park should be on your RVing bucket list this year. The Fjord cliffs loom over the Saguenay River for 105 kilometres before it flows into the St. Lawrence. Stay in nearby Tadoussac or travel south to Quebec City. Maine’s Western Mountains Rangeley State Park are a hiker’s dream. Campsites span the lakeshore and Saddleback Mountain stretches above. This is the destination for you if you like to rest and relax in nature! Great Smoky Mountains National Park is one of the USA’s most visited parks for a good reason. Explore the Appalachian Mountains year-round, but the best time to camp is in the summer and early fall. Hike the trails, zip-line and enjoy unforgettable views. Head to South Carolina in the spring and fall for fewer crowds and warm temperatures. While Myrtle Beach is a bit too cold to comfortably camp in the winter months, this oceanside destination extends your summer camping into the shoulder seasons. What are you waiting for? We have plenty of resources if you need some guidance planning your next RV trip: campgrounds to check out, RV rentals for new campers, and RV dealers for those who want to upgrade their rig. And for your camping indulgence before the start of the season, visit one of the RV shows in Canada this winter and spring! Where will you camp in 2019? Join our community on < a href=”https://www.facebook.com/Go-RVing-Canada-156852814413471″ target=”_blank”>Facebook, Twitter, Instagram and Pinterest and let us know!